2018 marks the 10th year that Karen and I have sponsored the Michael L. Reid Volunteer of the Year Award. The background on the Michael L Reid Award. Mike joined the Clear Spring Volunteer Fire Company on November 11, 1979. Karen and I wanted to honor Mike for his dedication and we found no better way than to name an award in his honor and select a firefighter who goes above the call of duty as Mike has demonstrated in his years of service to our community. 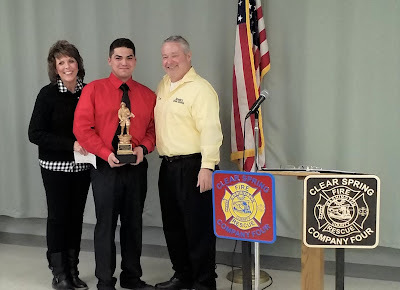 This years recipient is a six year member of the Clear Spring Volunteer Fire Company who responded to 55.46% of our emergency calls during 2018. He is one of only two members who responded to at least half of all our calls. He is one of the most selfless, dedicated and hard working individuals you could find anywhere. He takes pride in our Company and its apparatus and how our community views us is very important to him. No matter what task he’s assigned you can rest assured it will be completed to the best of his ability. He is a shining example of what’s good about our youth and what’s good about our community. His unspoken dream is to follow in the footsteps of his father, grandfather, great grandfather and great, great grandfather by serving as a Chief Officer in this Company. The Clear Spring Volunteer Fire Company is extremely fortunate to have him and some day he will do a great job as the Fire Chief. 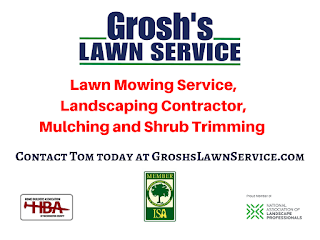 Karen and I proud to announce that Jacob T. Altman has been selected as the 2018 Michael L. Reid Volunteer of the Year Award Sponsored by Grosh’s Lawn Service. Jacob T. Altman receives a trophy and a check for $250.00 from Karen and Tom Grosh and Grosh's Lawn Service.